F.M., who wanted to remain anonymous, is a Muslim Canadian woman fearing for her future. She is a public sector employee in the Quebec city of Brossard who emigrated to Canada from Algeria 28 years ago. As part of her commitment to her faith, she wears a headscarf. Suddenly, she was told that the only home she knows might no longer allow her to perform her job while wearing a religious symbol. She will be forced to decide between her religious pledge to modesty and the employment she relies on to support her family. The PQ claims their aim is to lead a state “that treats everyone the same.” However, experts in the field of law say the enactment of such a law would be deemed unconstitutional by courts. “It would never withstand Charter scrutiny,” said Natasha Bakht, a law professor at the University of Ottawa, at a panel discussion held by Carleton University Sept. 24 to discuss the proposal. “It would in all likelihood be found contrary to sections 2a and 15, freedom of religion and equality under the Canadian Charter of Rights and Freedoms,” she said. If Quebec passes the legislation, and if the province’s courts uphold the proposal, its constitutionality can be challenged at the federal level at the Supreme Court of Canada or, if it comes into effect, someone who is no longer able to work as a public servant, such as F.M., can also challenge it. She can take the legislation to the courts herself and argue that it is violating her religious freedom, her equality rights and her equal access to employment. The Supreme Court of Canada will test the constitutionality of the legislation by determining if an infringement to the Charter of Rights and Freedoms is sufficiently justified, and if there is compelling evidence that demonstrates that rights must be compromised for the greater good of society. The government must also reach its objective by causing the least infringement on the right or freedom in question. 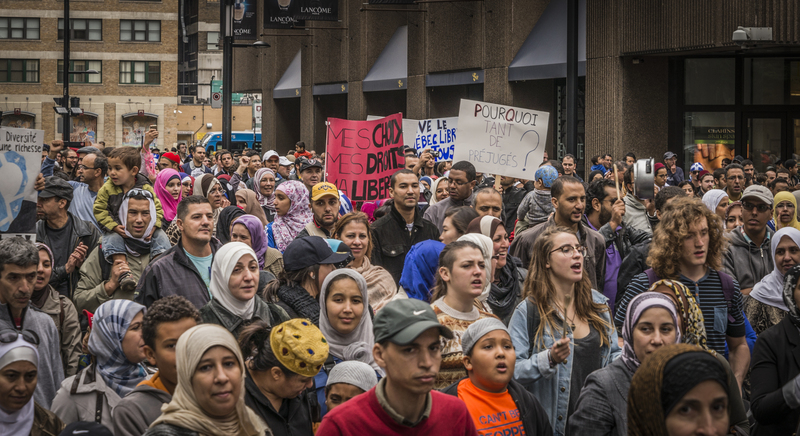 The document released by the PQ claims that the proposal is an answer to the religious accommodation cases that created “profound discomfort in Quebec.” Cara Faith Zwibel, director of the Fundamental Freedoms Program at the Canadian Civil Liberties Association, said discomfort is “not a good enough reason to violate people’s rights,” adding that the proposal is not compliant with Canada’s Charter. “I don’t think the proposal meets any of those requirements,” she said. In a 2004 case called Syndicat Nothcrest v. Amselem, the Supreme Court ruled that condominium bylaws which prevented orthodox Jews from setting up “succahs” or temporary dwellings on their balconies for a religious holiday, violated the guarantee of freedom of religion under section 3 of Quebec’s Charter of Human Rights and Freedoms. At the panel, Bakht said religious accommodation cases emphasize the importance of evidence when it comes to limiting religious rights. “These cases function as a true statement to our traditions and values including an emphasis on sufficiency of proof when the state attempts to infringe on the rights and freedoms of minorities, and an assumption that religious accommodation has significant social value,” she said. Since its implementation in 1975, the Quebec Charter has guaranteed Quebec citizens the fundamental freedom of religion, which is emphasized in several of the province’s religious cases. Quebec’s Human Rights Commission has opposed their government’s proposal, with its chairman, Jacques Fremont, calling it “the most radical proposal modifying the Charter since its adoption.” Legal experts believe the Quebec courts will also see the proposal as a violation to their values. The alleged “neutrality” of the proposed charter of values is also being questioned, considering the crucifix will continue hanging in the National Assembly, which is viewed as a conspicuous symbol. “If the real concern here is appearances of partiality towards one religious group or another, it makes no sense to me that a large conspicuous symbol will still hang in the place where laws are debated and passed,” said Zwibel. If the reason behind the proposed charter of values is intolerance of religion or religious minorities, Bakht said it would “undoubtedly” violate both the Canadian Charter and the Quebec Charter. “This proposal is going to taint Quebec,” said Bakht.